Remember, we are on a journey. We’re a family of families led by God to frontiers; places where we get to join in with him making life better. As we go it is vital that we pay attention to the Father. As one of our vision team put it the other day “An MSC without Up is just a social action club!” It’s succinct and true. We can’t lose the connection to our Father. Think, for a moment, about the things you eat during the day. Most of us split our food into two types – meals and snacks. Three (usually) times a day we sit with someone and eat a meal; sandwiches, cereal and fruit, hot dinner and so on. This takes a bit of time, it can feel like a bit of an investment, we may rush it, but we all take time to sit and eat. Most of us also snack – we eat on the go. If you are healthy this might be fruit or some seeds, it could be a bag of crisps a cake or a chocolate bar. You don’t have to take lots of time on it and you don’t have to eat loads, just enough to get energy levels up. This is a great way of thinking about our prayer and worship life together: how would you rate your community’s Up? Do you snack together regularly, do you ever take time to sit and eat? Here are a few ideas of things you could try. If you’re gathering for (a real, non metaphorical) meal, make sure you do a decent grace. Use texts messages, Whatsapp or Facebook to share community prayer requests, testimonies or things you feel the Lord is saying. These can be really good because they can be so instant. Pause to pray in your day – talk about whether you stop at 12 with the rest of the church. Could you build in another time just for your community? Watch a worship video – find a song, or an inspiring video and play it together for a few minutes. Have a worship night: I love it when the communities I have been part of sing and wait on God together. There is something really special about these times. You can use a guitar if you want to but there are other ways of worshipping – a bit of creative planning and you’ll come up with some great ideas. Discovery Bible Study: Lots of us have been finding these very helpful to get us regularly reading and digesting the bible together. Thanksgiving – Spend a bit of time talking about the good things God is doing. You may have to work to prompt some people to spot these in their lives. Share your stories and then start to pray, thank God for his good work and ask him to deepen it in you. Prayer walk a neighbourhood – want to hear God’s heart for the people around you? Go for a walk together with Jesus and ask him what he is thinking. Explore a spiritual discipline – read together about a particular practice. Decide that you are going to commit to doing that together for a while. Have a community night of prayer – Book a longer chunk of time and pray together – once again be a creative as you want to. Share communion together, if you are actually eating together why not get bread and wine and turn it into communion. If you decide to do this from time to time Mark or I would love to join you. Want to go further? Here are two recent blog posts that explore worship and prayer more deeply. Tell us what you think? My ideas are really just starters, there is so much more you can do. How do you currently approach up together as an MSC, is there something you feel led to take on? Tell us in the comments below. I’ve found the Father, Family, Frontier triangle that Mark introduced to us last week helpful and challenging. As I’ve been chewing it over this last couple of weeks my feelings have been summed up by another F – Further. I have felt a call to go further. Pursue a closer relationship with the Father. Seek to build deeper relationships with the family-on-mission that I lead. Push out more into the frontiers that he has called me to pursue. God is calling, actually God is taking me futher. Here’s another way to describe this feeling. It feels like the water level of my life is rising. Actually it feels like the water level of our church is rising. This isn’t about having to, work harder or, be productive, its about noticing something God is doing. It seems that we’re going deeper quicker when we gather together. I am also hearing exciting rumours – stories of one or two people getting saved. Plans for a greater pushing out of MSCs. Is it me, or is the water level rising? This week I’ve been drawn to a verse in Ezekiel 47. God’s presence with his people is described as a river, flowing from the temple out to the dry and dead places, bringing life as it goes. There is a key point when the writer says the river became too deep to cross and he had to swim. There is a challenging side to this. Crossing the river is about coping, its about control and trying to manage life. 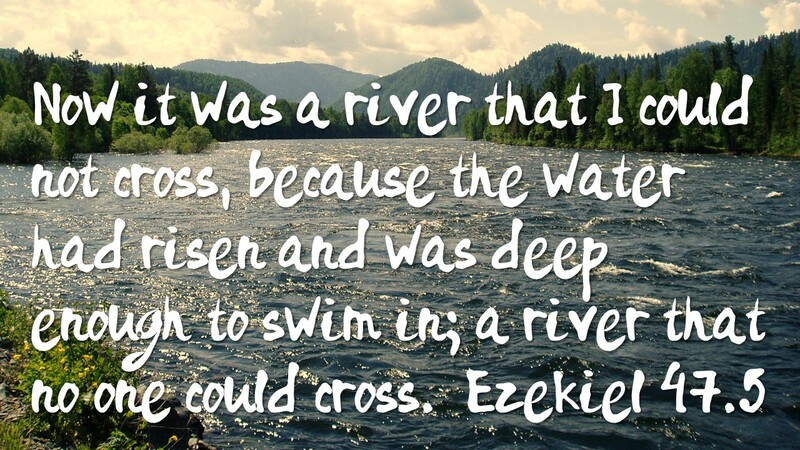 When a river is too deep to cross, you just have to surrender and let it carry you. As I look at our family-of families I can see quite a few challenging things going on: in our relationships with each other, in our use of money and time. I wonder if the river is getting just a bit too deep for us to cope. To be honest I’m longing for, praying for, hoping that the river would get to deep for us to cope and that we would have to learn to swim and be carried by God’s presence to bring life to the broken and lost. Are things feeling challenging? Be encouraged! Keep going, but resist the temptations to cope and control. Keep looking for signs that God is taking us deeper and further. Trust the Father and follow where he is leading you.